Creative Sound BlasterX H7 headset reviewed using a variety of devices via analog, but primarily with the PS4 and PC via the included USB DAC. When Creative announced the BlasterX line of audio equipment, it was pretty clear that the longtime PC audio purveyor was taking a strong tack. 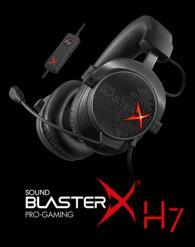 At the head of this approach is the Sound BlasterX H7 headset. While similar in form in function to the H5, the H7 offers both an analog connection and a USB connection that works on both PC/Mac, and PS4. The H7 has angled 50mm drivers in a familiar and popular aluminum and steel form. A detachable boom mic and inline controls round out the feature set. Included in the plastic capsule case with the headset are two braided nylon cables, a 3.5mm to 3.5mm male cable and a microUSB cable. It's been a little while since I reviewed the BlasterX H5, and considering how similar it is to the H7, I'm struck with a conundrum. On paper, I like the H5 more, but in practice, I have a much stronger affinity for the H7. In both cases, the analog abilities of the headset really require a decent amp/DAC combo to reach their performance potential. That should mean that the cheaper H5 is the obvious choice, but the H7's extra USB-based features are ultimately too attractive to ignore. Here again, what I was expecting with the H7 was for a small USB DAC to be bundled with an analog headset. Upon opening up the H7, however, I was disappointed to find that the USB DAC is integrated into the H7's fixed cable and inline controls. This prevents me from taking the USB DAC and pairing it up with any number of headsets, including the H5, the HyperX Cloud II, Astro A40, and so on. While bundled USB DACs for PC headsets are a dime a dozen, Creative's H7 solution is also compatible with the PS4 (as well as Mac). That means any users wanting a hardline, non-controller connection between their headset and the PS4, have it with H7. At the same time, however, they also have the option to connect to the DualShock4, or even, in my case, the Xbox Elite controller. For me, this means connecting the H7's inline volume control module (which is where the DAC is) to the included microUSB cable, which then connects to a Belkin USB extension cable and to the front of the PS4. At which point, if I'm being honest, the performance is quiet similar to connecting to the DualShock4, but without the inconsistency or the extra battery pull. The PS4 just sees the H7 as a USB headset, so compatibility is perfect. The little DAC works, and it works while letting the volume control and mic mute switch on the inline module work as well. With the H7 on-hand, I was able to be creeped out by the sound design of 'Dark Souls III' and of course, that was without disturbing anyone in the next room. It's a real credit to the headset that I could stalk around the Kingdom of Lothric (in SP and in co-op) for hours on end without feeling suffocated or otherwise feel a strain on my ears. The H7 also did quite well with this year's banner PS4 title, 'Uncharted 4: A Thief's End.' In fact, the headset did a great job of making the most out of the game's incredible sound design in SP while presenting a nice tactical advantage in MP. Being able to recognize and identify when companions spawn is key in the multiplayer, and the H7's clean and balanced sound reproduction is quite enabling. The crux is that the inline module is not up to the standard of a good, powered, and dedicated amp/combo, which admittedly would be way more money. But again, while the USB DAC is integrated, it's easy enough to go the analog route. (The mic on the PS4 notwithstanding.) I think the USB DAC fairs a lot better than several other pack-in options I've used. While it's strictly stereo on the PS4, using the H7 on the PC opens a nice world of audio software options, including the BlasterX Acoustic Engine Pro. This is a great way to get some impressive virtual surround going. I've used this software on several products, and I like being able to use specific profiles, Scout Mode, or also, being able to go for something more pure when I'm listening to music. What I haven't seen before is the alternate option X-Plus Mode Configurator software. It's a viable alternatively for sure, especially for any users who primarily play two or so very specific games, and don't want to mess with any deeper options. I like taking a headset like this and its software on the road with different laptops. When using the USB connection on PC, the inline control's Play/Pause button does work on the PC, which is not something I've seen in other wired headsets. Both included cables are on the short side, which is fine if hooked to DualShock 4 or Xbox Elite controller, but seems short for other uses. I love the H5's Y adapter/extension, and it's a shame that piece isn't in the H7 package. With both the USB analog connections, the H7 can be a nice plug and play option. For example, connecting the USB to the PS4 while mid-game, will immediately switch the PS4 to the headset, which is at least as smooth as connecting to the controller. One thing to note, however, is that if the headset has both a 3.5mm and USB cable connected, the USB connection will be disabled until the 3.5mm cable is disconnected. Each ear has a BlasterX logo that illuminates and pulses. This can be tweaked on PC, but not on PS4. Much like the H5, I think the cable connection to the headset could be positioned better. It's bad enough on the H7 to worry me as a potential fail point after some years' use. The headband, meanwhile, feels strong but flexible. After a little break-in, the fit is good, but does fall short of being great. The mic appears to be identical to the H5. As a removable, flexible boom mic, the H7's mic acquits itself well enough, and I'm glad to always have a mute switch nearby. The capsule case/packaging is the same as the H5, and I still really dislike it. Specifically, in terms of a case, I would prefer something in nylon. With the Sound BlasterX H7, users can expect to have both a nice analog stereo headset and a good onboard USB option for both the PC and PS4. That USB option is good for when a pricey DAC doesn't make sense or isn't available. The H7 then is a very good headset that does several things well, including gaming, and is worth being on a shortlist of headsets to consider picking up in 2016.